What is a hamfish? And what relation does it have to the Brut IPA style? 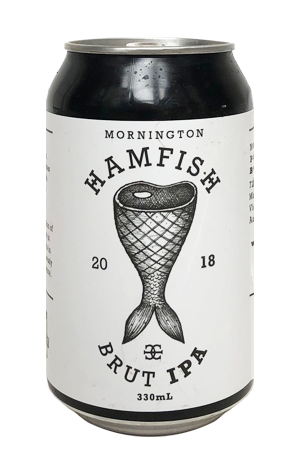 Well, it turns out Hamfish is the nickname of Mornington brewer Hamish and, when the team there was thinking about a name for this Brut IPA they deemed it appropriate. Why? They figured there was a "pompous beer-wankiness" to the style and Hamfish was its "vulgar antithesis" – a means of "taking the piss out of the style and ourselves for being late to the Brut IPA party". For all that there's humour on that side of things in what's the first Mornington Specialty release to come in black cans, they've put out a beer that ticks the boxes for the style. A combination of Champagne yeast and Hallertau Blanc, Mosaic and Galaxy hops come together in a very pale, lightly hazy beer with lean gooseberry, lime and white grape aromas. The hop flavours present as more potent on the palate where the brewers have created a beer that's perceived as full and with depth yet still lean and dry. Nothing hamfishted about it, at all.